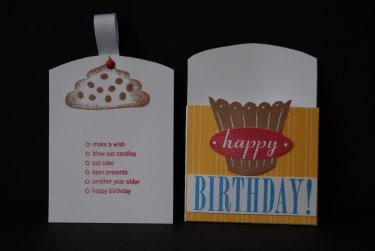 Here is another card based on a pattern from our new Wishes Cardmaking book. I'm having so much fun playing around with all the new patterns and getting ideas from all the gorgeous artwork in this book! This particular card was inspired by one I saw on the CTMH consultant bulletin board. Here I paired up Animal Cookies with Cupcake Sprinkles and the August Stamp of the Month (you really need to get this stamp set) to make a sweet little card you could attach to a birthday gift or gift bag. Next time I make this card I'll either add ink to the edge of the Birthday! sentiment cardstock or back it with a mat for framing. Its a wee bit small to put a gift card in so I might tweak the pattern a bit to accommodate a gift card when we make this at our August 14th Creative Class. 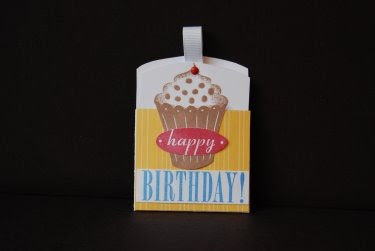 My ladies have requested kid birthday cards or gift tags which is why I'm posting so many kid cards! I like to play around a bit and then choose which ones to make for class night. Great card Paige!! This is so cute!